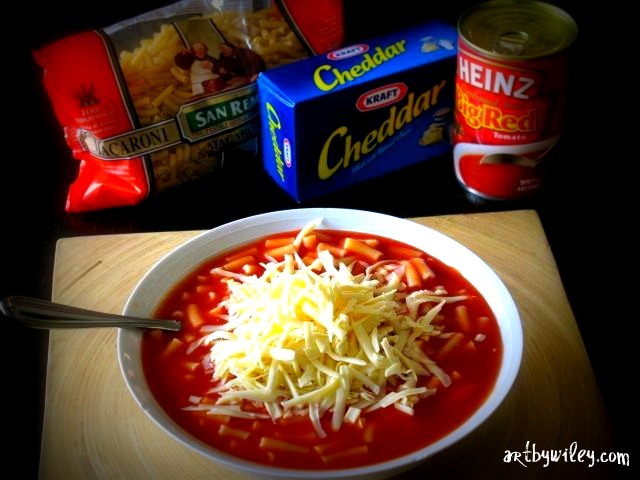 Macaroni and Tomato Soup. Have you heard of it? No, neither had I until I met Kim. It is the single-most consumed meal in this house, closely followed by chocolate. Okay, I know chocolate is not technically a meal. I do know that. At first I was dubious (see the ingredients? yep, that's it! ), but the truth is, I'm a convert to this comfort meal of indeterminate origin. 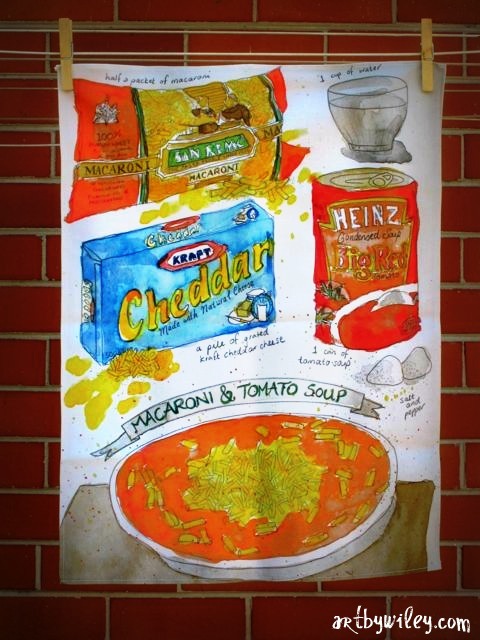 Family legend has it that it may have been created by Kim's mum's mum by pantry items that were always on hand. But there's no way to confirm it. What can be confirmed is that everyone loves it: Kim, his brothers, his sister, his mum, aunty, uncles, cousins - the passion and ardour inspired by this meal is far-reaching. 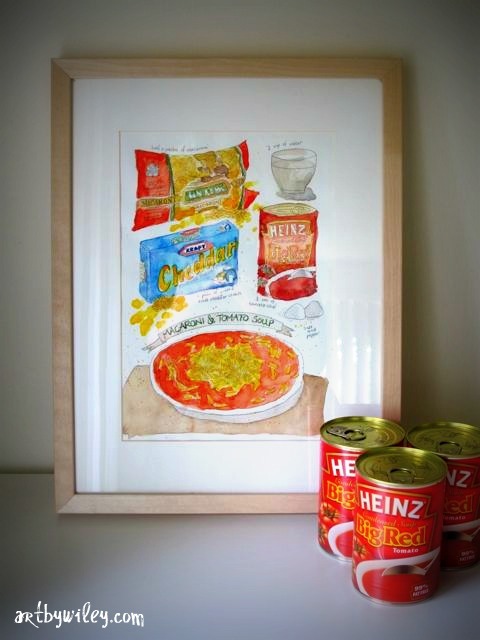 And so when I took Dawn Tan's watercolour class early last year and had to choose a recipe to illustrate, well, it was obvious wasn't it? 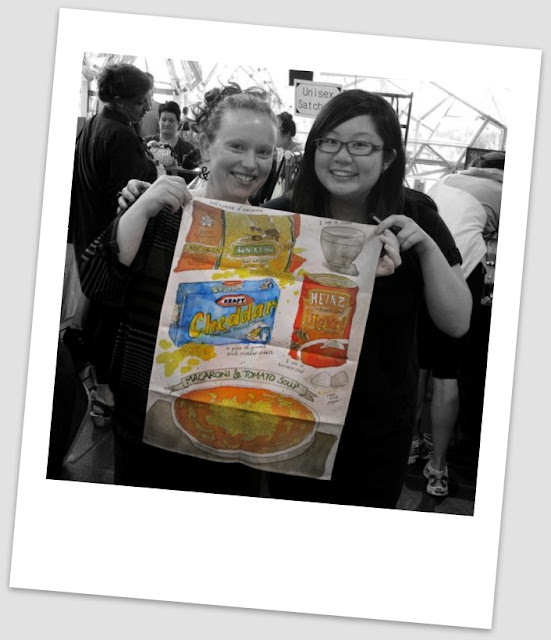 And while doing the class Dawn planted a seed in my mind for the most awesome gifts - tea-towels! So with the aid of a camera, Spoonflower and the super-dooper sewing skills of my mum, I managed to create these tea-towels for every member of Kim's family who is evangelical about this meal. And boy it was fun giving them out at the family New Year's Eve BBQ! 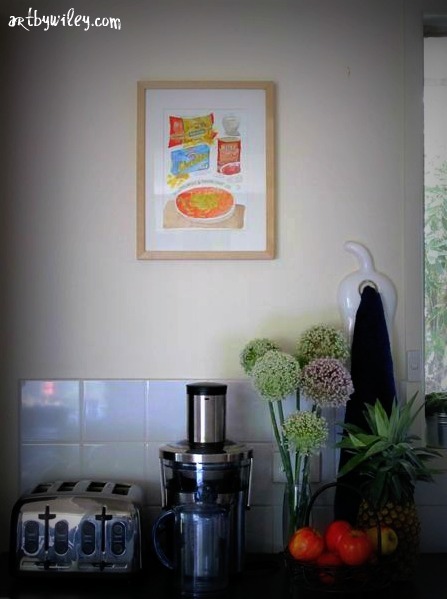 The original watercolour is framed and hanging in our kitchen. I'd never worked with watercolours before so this was a big learning curve but oh, so much fun! Dawn got in there with a paintbrush a couple of times to help me out and so all the really good bits I will credit to her. All the dodgy bits are all my own! Pssst. Do you like our dog's-bum hand-towel holder?!?! So thanks to Dawn, her awesome class, her generous nature and amazing talent in art and in teaching, I was able to create these personal gifts that made me so happy to give! Thanks, Dawn! Me showing Dawn the end result! Postscript: Kim just read this post and said, 'couldn't you write a paragraph of words describing how awesome this meal is?' He suggested: incredible, amazing, life-changing, sensational and cheese-o-riffic. I said, 'no'.